Kapidan Mark Gjon Marku was born in Orosh, Mirdita, in 1913. He was the first son born to Kapidan Gjon Markagjoni and Mrika Pervizi Markagjoni. A new Kapidan patriot, who would for years remain at the forefront of the war as a symbol for ethnic Albania. Mark was educated in the national spirit. He grew up in Orosh where the Kapidans of Mirdita lived and where for centuries they preserved the Kanun and national traditions with Albanian-known principles; honor, faith and loyalty. His father, Kapidan Gjon Markagjoni believed that all his sons should be educated and sent Mark to Rome to continue his studies at the University where he graduated with a Doctorate of Law. 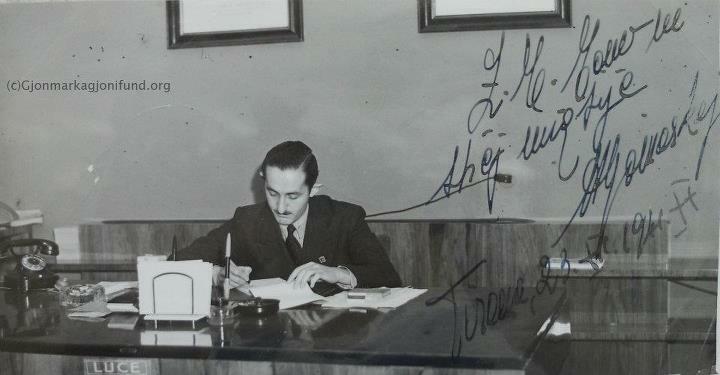 Upon returning to Albania and witnessing the gradual takeover of communism Dr. Mark organized the “National Constitutional Assembly”, which was held in Tirana on October 23, 1943. As the increase of communist partisanship continued Kapidan Mark established the “Independent National Group” in March 1944, where the primary task was to fight communism in all Albanian lands, as sworn by the national constitutional assembly to Tirana. Over time the communists mounted provocations, which were supported by their brethren passing as intellectual Yugoslav and Russian mercenaries. After a great resistance to anti-communism, Kapidan Mark led the fight for an Ethnic Albania in all Albanian territories. When nationalist forces began to weaken and when suggested that he leave Albania to head west, he responded “I have not yet performed the task for my country. I cannot leave men who have pledged to fight. My destiny is closely related to their fate. I know it will fall, but for me it is better to die with a bullet in my face than to break ranks with them, defeating the master now before they befall on our Albanian people”. Kapidan Mark, during a fierce battle against the communists backed by the Russians and Yugoslavs, was severely injured and not wishing to be captured alive, died heroically in Perlatit-Këthell on June 14, 1946 at the age of 33, after a sensational career as a patriot and politician. He fell in the field of honor, the first son of Kapidan Gjon Markagjoni. He died heroically trying to rid his homeland of communism and fighting for an ethnic Albania. Kapidan Mark left behind his wife Marta, two daughters Kristina and Celestina and one son Gjon. The family was arrested and lived their lives interned in camps. 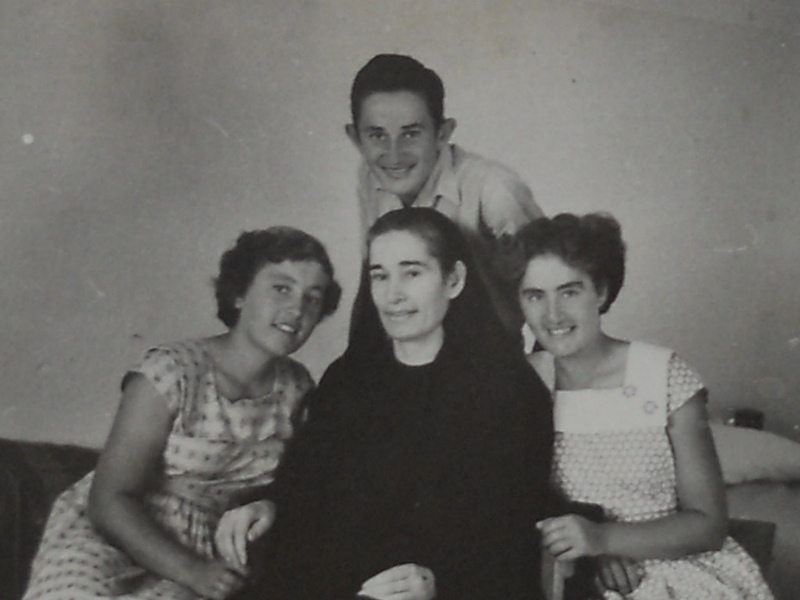 His wife Marta became totally paralyzed while in the camps and died in 1974. The rest of his family including his only son, Kapidan Gjon Mark Markagjoni, was released after the fall of the communist regime in 1991. He went to live in the family home in Shkoder and continued the tradition passed down to him as Kapidan, working effortlessly to help Albanians rebuild the country after the fall of the regime. He was elected Deputy of Mirdite and served a 2 year term, after which he dedicated himself working effortlessly with the Austrian non-profit Organization Caritas. However, his dreams were cut short when he died in 2003 after a long illness. Mark’s daughters, Kristina and Celestina are both widowed. Kristina lives in Shkoder with her son Alban, the only grandson of Kapidan Mark Gjon Marku (Gjomarkaj). Celestina lives with her daughter, Nina, the only grand-daughter of Kapidan Mark, her son-in-law and two small grandchildren in the USA.